Monetizing from a Blog is always a primary objective of Blogger, apart from hundreds of ways and monetizing companies scattered over the web, VigLink is something different from traditional earning method. With their innovative technology Viglink makes you to earn money by affiliating with more than 30,00 retailers around the globe. Viglink converts your ordinary link to Affiliate link relevant to your content which results in maximize earnings via intext ads. If you are thinking to monetize your Blog using Affiliate links, Then just Enable VigLink on your Blog/Website as it is the best revolutionary way to earn from maximum advertisers using once single platform. If you are using Infolinks or any other In-text Program, I would strongly recommend you to replace your Traditional In-text Advertising by VigLink as this will give you whole affiliate commission for every sale or lead completed via your Blog. this is just simple, You don’t need to manually place links or banners. Just one time enabling of Viglink code on your Blog is enough. VigLink automatically pays you when people buy the brands and products you write about. VigLink is like a In-text ads program, Yeah there will be no banners or visual ads, It connects your existing links of your blog with more than 30,000 merchants, So When your links are clicked and your readers buy, their technology ensures your site gets credit. Their innovative technology optimizes with maximum profit of yours from different advertisers relevant to your content. 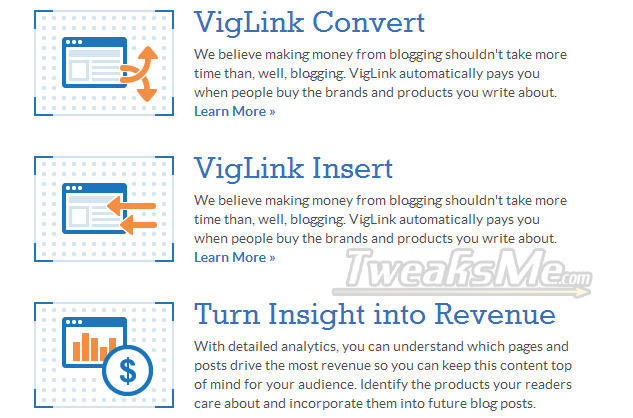 Viglink is free and simple to use, At first you need to sign-up and enable a short snippet of VigLink code on your Blog, They have their one click install plugins for WordPress and Blogger. After that readers will click and Buy products or services from your Link, you will be paid. Their innovate technology optimizes and ensure you get the Credit. When a commission is eared VigLink pays you. thats all. Why choose VigLink over other Programs? If you are placing Affiliate links on your blog from different websites then it is always better to Switch to vigLink as Viglink have almost All Companies in every category including Amazon, Ebay, Bluehost, godaddy, etc… under their network and hence you can easily manage all your affiliate income from One dashboard. VigLink pays you 75% OFF the commission you generates and they keep 25% with them. Its simple and you do not need hard-work to place links or offers. For example if you are writing a review on Any Smartphone, Lets take Sony Xperia Z for example. So if VigLink is enables on your Blog, It will Automatically integrate links from Amazon or Ebay or Sony in the post, So when a user click on the link and buy that Smartphone, A Huge commission will be credited to you. Similarly this goes for every categories. Hence you can make great income fully automated. Earn from clicks to over 30,000 sites, automatically. VigLink Insert automatically turns brands, stores, and products into relevant, ordinary links (that pay). That’s All about VigLink. Instead of using various affiliate programs or other In-text advertising company its better to implement vigLink on your Blog so earn more than what is expected. The Company is have great advertisers which pays maximum to their publishers. Sign-up today at VigLink.com and do let us know about your Earnings Experience.